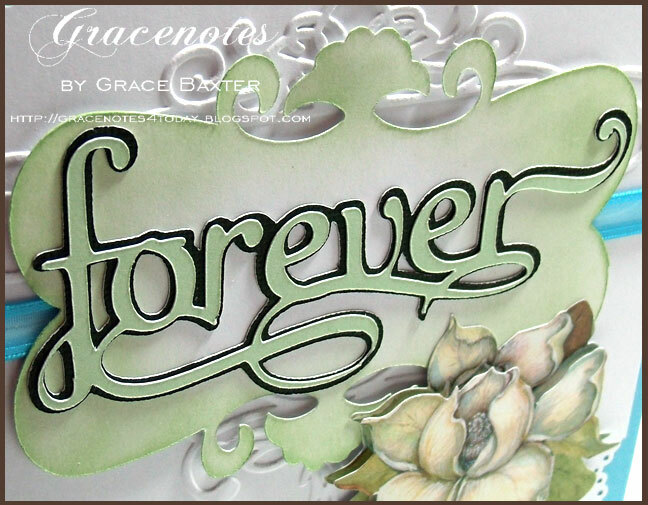 With Mother's Day just a few days away, it is especially sad that I am having to make a sympathy card. There is no acceptable time to lose a Mother, and it is especially difficult for the family to lose her so near to the day they would normally celebrate her life. 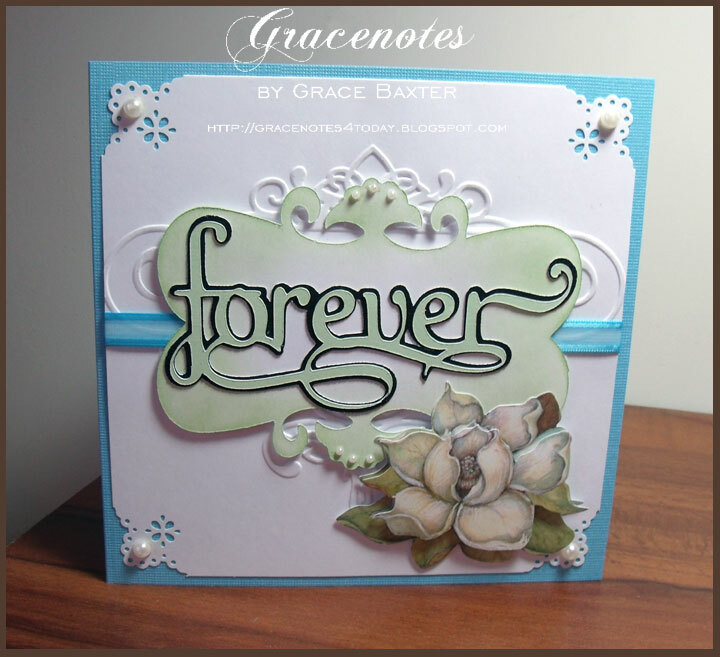 This card is 5-1/2" x 5-1/2" aqua. The white panel is 5"x5", embossed on the CB and corners punched with MS Lace punch. The cartouche frame is from Storybook cut at size 3 on Accent/Blackout. 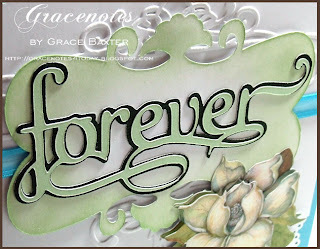 The word "forever" is from Home Décor cut on my Gypsy in order to get an "in-between" size that would fit the cartouche frame nicely. I sponged around the edges with Aloe Vera green. The flower is from a purchased package by K&Co. Its size is 4.09w x 1.89h cut from green. Shadow is 4.21w x 1.91h cut from dark brown. The poem is one I composed several months ago and it says exactly what I would want to say to anyone having suffered the loss of a close relative. Mother's Day is always a mixed bouquet of happiness and sadness for me. My own Mom died just two days after Mother's Day a few years. So I totally feel for the young woman who is the recipient of this card. The joyous thing to remember is, we will see our loved ones again. Pearls in two different sizes embellish the corners and the cartouche frame. Under the white background I slipped an aqua sheer and satin ribbon, to bring the aqua colour forward onto the card. I love how the soft green harmonizes with the aqua. Happy Mother's Day to all of you who are moms and grandmothers! 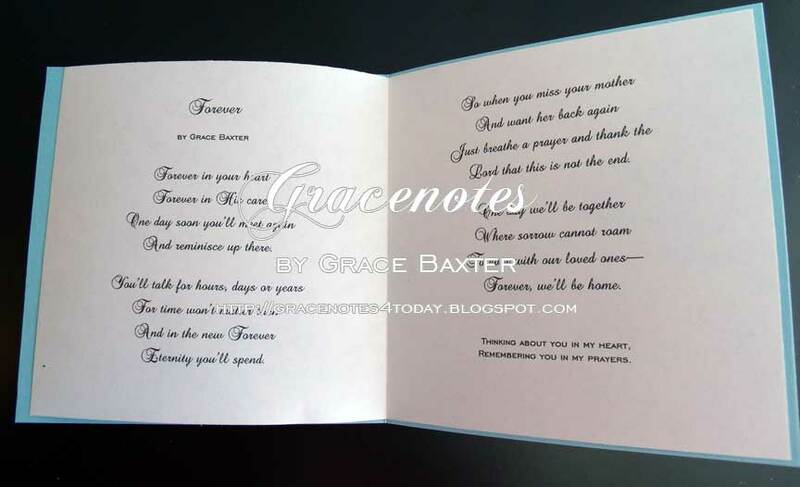 Grace, what beautiful and elegant card. I love all the details. This card would bring comfort to anyone. Thank you for sharing your wonderful talent with us. You are so creative. Your work is so beautiful... I'm officially a fan. Thank you for the following my blog as well. You're a doll! 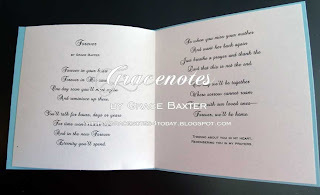 Your card is so elegant and beautiful, and I especially love your poem. It is absolutely perfect - very meaningful. I'm sure the recipient will appreciate this and gain comfort from it. I've not had much time, but am spending today checking out everything I've missed on your blog.